The once infamous El Raval district of Barcelona still conveys, for most people, an insecure image. The City Council commissioned a logo and a campaign to improve the perception of the neighbourhood. The campaign included the addition of a new verb to the Spanish language to highlight changes in the character of the area. The aim is to attract new visitors to the Raval, create pride of belonging amongst its residents and help develop a new brand image for the district. The Barcelona City Council wants to improve the perception of one of its most marginal and insecure inner city districts: the Raval. The campaign seeks to project a more cohesive image of the neighbourhood but without losing its characteristic identity and personality. The aim is to attract new visitors to the district and create a pride of belonging amongst its residents. 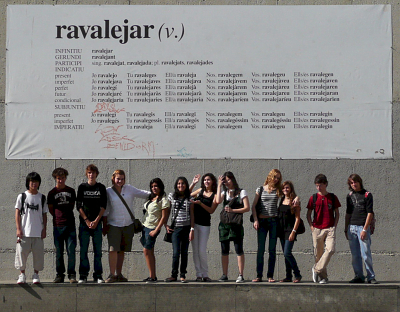 The proposal to introduce a new verb, Ravalear (Ravalejar in Catalan), is meant to create a brand personality for the neighbourhood: a way of life, of feeling, of doing things. The verb represents the edgy attitude and nervous energy of the Raval, is deliberately ill-defined and meant to be interpreted in an individual way. To Ravalejar, simply visit and take in the atmosphere of the Raval and have fun in the wide range of bars and clubs. The 'new look' Raval: an urban rebranding success?